Many people believe that once they’ve vaccinated their dog, their pet is no longer at risk of contracting the Parvo virus. Unfortunately, this is not the case. The Parvo virus is highly infectious and poses a great threat to your canine pal, vaccinated or not and kenneling may increase your dog’s risk. This is partly why personalized, in-home pet sitting has grown as the preferred method of pet care. That’s right, even though you may have vaccinated your dog against this virus, your dog may still contract this deadly disease. Why? This virus mutates and there are several strains in the environment and that is why a vaccination is not a guarantee that your dog will not contract the virus. Other factors (see below) may also lead to an unsuccessful immunization for your pet, leaving your best friend susceptible to the disease. Where is this virus and how does it spread? The virus is found in the dog waste of animals which are infected. Anything or anyone which comes in contact with these feces can spread the virus into the environment and thus cause further infections in other dogs. The virus can be spread by insects, rodents, cats, dogs and people. The virus does not need a living host to survive. In other words, this virus can survive on inanimate objects for long periods of time. Some strains of the virus are quite hardy and can live on clothing, shoes, floors, grass, walkways for months at a time. The virus lives in the gastrointestinal tract of the animal which means the virus can be exposed to the environment through vomit as well. Animals which seem to be disoriented and have bloody stools may be infected with the Parvo virus. Immediate care from a Veterinarian is needed. 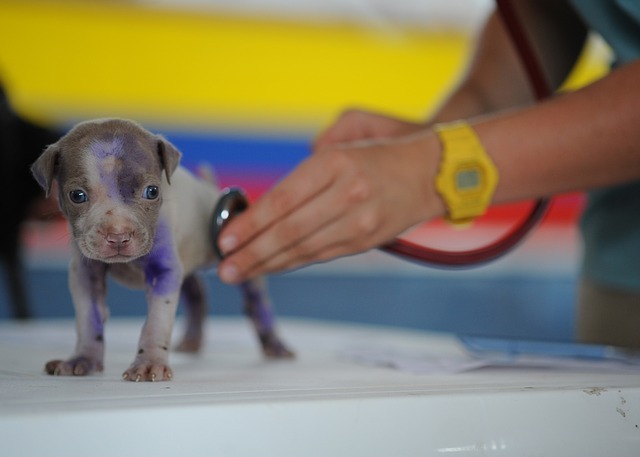 Under what conditions is the Parvovirus Vaccine rendered ineffective? Have you heard that breast feeding is best for your baby? Well it is best for dogs as well. The canine mother’s milk is loaded with protective proteins called antibodies shortly after birth. These antibodies help protect the new born pups from developing infections. The Parvovirus Vaccine contains live viruses which have been attenuated (weakened) by commercial processing. When the puppy is vaccinated, the maternal antibody in the puppy may be too high, in which case the antibody will kill off the vaccine leaving the puppy susceptible to the virus. In order for the vaccine to be effective the immunization must occur at a time when the maternal antibody in the puppy is low so the vaccine can survive and be effective. It is at this time that puppies can also contract the Parvovirus. In other words there is a time period in which the antibodies in the puppy are too low to protect against the disease but are too high to allow the vaccine to work. This is why a puppy can contract the parvovirus despite being vaccinated. This time period is called the window of susceptibility and there are many factors that can affect this time window. Unfortunately, despite the best efforts of loving pet parents, the Parvo virus still takes its devastating toll. You can almost bet that any kennel will eventually be exposed to the virus. This is why vaccination verification protocols, disinfecting protocols, kennel staff education, containment procedures, and historical incidence reports are good to inquire about when considering boarding your dog in a kennel. This is also another reason why more and more people are choosing pet sitting as the preferred method of care for their animals. Likewise, this is also why dog waste removal services have grown in popularity. So what would you look for if you suspect Parvo? Is your dog lethargic? If your dog or puppy seems out of energy or tired this may be the onset of Parvo. High fever, depression, and loss of appetite are early symptoms of the disease. Your pet may develop diarrhea and vomiting and may stop eating. The dog waste becomes runny, bloody and foul smelling. This leads to dehydration, electrolyte imbalances, reduced blood pressure, disorientation and eventually shock leading to death. Please see your veterinarian regarding the best strategy to vaccinate your puppy and help prevent the spread of this deadly virus. If you suspect Parvo virus please see your veterinarian immediately.